Before the days of plastic and Pyrex, most American homemakers used a set of yellow ware bowls in their kitchens. The first pieces of yellow ware, made in Scotland and England during the late 1600s, were made from a clay that was a yellow buff color. Yellow clay contains a much lower level of iron causing it to vitrify at temperatures much higher than red clay, making yellow clay pieces much harder and more desirable for use in the kitchen. 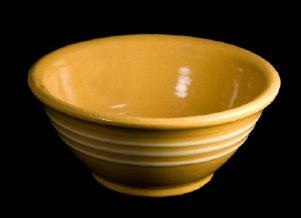 The popularity of yellow ware, always known as yellowware, spread from England to France, Canada and the United States. By the 1830s, the beautifully colored pieces were being made in the United States using fine yellow colored clay found along the banks of rivers of New York, New Jersey, Pennsylvania and Ohio. Depending on the origin of the clay, finished pieces ranged in color from a deep mustard yellow to a beautiful light yellow resembling the color of fresh butter. Due to its low cost and durability yellow ware remained the popular choice for use in kitchens for more than a century. It fell out of favor with homemakers in the 1940s, being replaced by pieces made of modern materials of the times. The diameters of the graduated sized bowls range from three inches to seventeen inches. In addition to nesting bowls, there are many single piece yellow ware bowls of all sizes that are of interest to collectors. On bowls, the lips of pieces made in the 1800s are usually rolled. Bowls from the 1900s typically have lips that are much less rounded or they have a rim that is wide collared. Solidly tap the piece using the tip of your finger. If the sound you hear is a thud, it is probable that it was made in the United States. If the sound you hear is a ringing, it is probable the piece was made in England. One way to tell a piece that is not authentic is to check the color of the glaze. The glaze should be clear, if the glaze has color it is most likely a reproduction or a counterfeit piece. The glaze on yellow ware contains lead. If you have a bowl with chips, cracks or deep crazing do not use it for mixing, cooking, baking or storing any food. Never store food in the refrigerator in yellow ware, regardless of its condition, or use it in any way with foods that are acidic or for baking. Using yellow ware in these ways can cause the lead to leach out of the glaze and into the food. Yellow ware bowls are beautiful antique collectibles that bring back happy nostalgic memories to many people. They make lovely additions to the decor of a country kitchen and are safe to use for food preparation in some cases.